From Moonscape To Lush: Photographs Capture California Drought's Story Getty Images photographer Justin Sullivan's "before-and-after" images show how recent rains in California swelled formerly dry reservoirs and turned brown landscapes green. 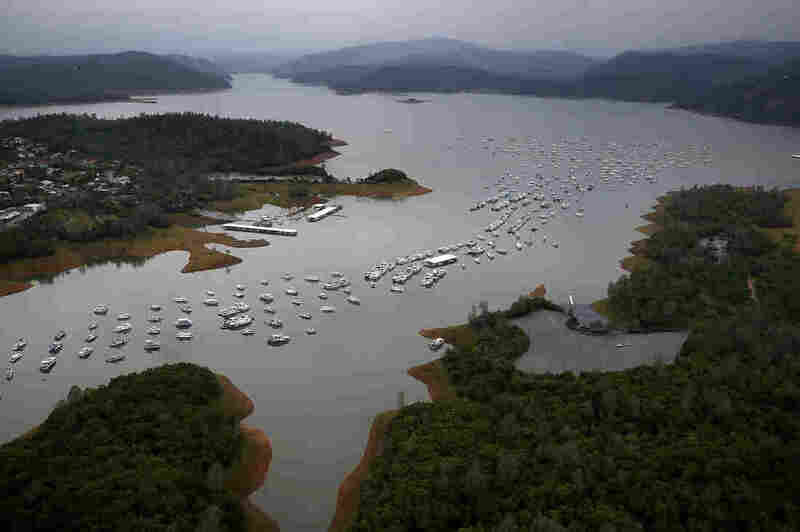 Bidwell Marina at Lake Oroville in April in Oroville, Calif. After record rainfall and snow in the mountains, much of California's landscape has turned from brown to green and reservoirs across the state are near capacity. 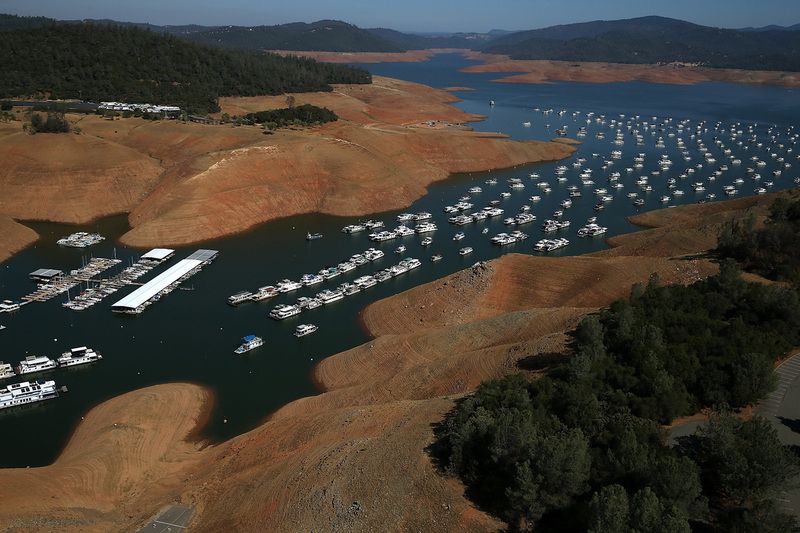 In California, an extremely wet winter put an end to the state's record-breaking drought. Heavy rainfall also produced welcome spring scenes — like replenished reservoirs and fields in bloom. "It's a completely different look," says Justin Sullivan, a Getty Images photographer who took before-and-after style photos of drought-stricken areas. "It's just like a velvety green, lush landscape now — compared to just dry, brown, almost like a moonscape before." Sullivan's photos show how one of the wettest winters on record is bringing the land back to life. In early 2014, Sullivan documented the drought at its worst. He shot photos from a helicopter above reservoirs like Lake Oroville. "It's a little surprising to see the recessed water in reservoirs that reveals banks that are 50, 60, 100 feet tall," he says on NPR's Morning Edition. "They look like little mini-mountains and then a little river running through them." The Enterprise Bridge in Oroville, during severe drought in 2014 (left) and this April, during the week that the majority of the state's drought emergency is due to be lifted. Earlier this month, California Gov. Jerry Brown declared an end to the state's drought emergency. Now, many of those desolate landscapes Sullivan captured look completely different. So he went back and tried to re-create the same shots. A dog walker on a dried section of Bernal Heights Park in 2014 in San Francisco (left). When Sullivan returned to the hillside this year, he was able to snap a photo of a woman walking her dog in almost the exact same spot. "We just wanted to show the contrast," he says, adding that it was a tricky assignment. "Obviously, landscapes change over the course of three years. Trees grow bigger. So it was difficult to just remember in your mind exactly what lens you used and how you approached it." Sullivan downloaded the 2014 images onto his iPad and brought it with him when he shot the "after" photos. In trying to re-create the exact same frame, Sullivan had some luck on his side. In one side-by-side set of photos, the 2014 version shows a man walking his dog. The man is surrounded by dead grass, with the San Francisco skyline in the background. When Sullivan returned to the (now green, grassy) hillside this year, he was able to snap a photo of a woman walking another dog in almost the exact same spot. "Sometimes they just work out perfectly," he says. Low water levels are visible in the Bidwell Marina at Lake Oroville in August 2014.